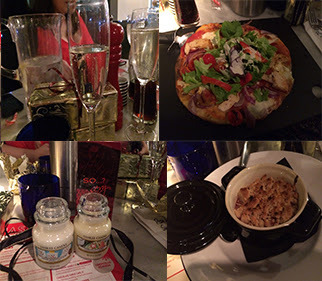 On Friday evening I attended the Herts Bloggers Xmas Party at Pizza Express in St Albans organised by the lovely Sarah and Scarlett. I love blogger meet ups and events, especially as it gives you the chance to meet fellow bloggers, have a chat and really get to know the blogger behind the blog. Of course this one was no different, and I really love that it was local bloggers. It was a great chance to meet up with some local bloggers, have some food, and a chance to chat. I turned up with my usual companion Bex, to be greated by Sarah and Scarlett. Shortly after Emily, Katie and Beth all turned up and the Prosecco was flowing. I love Pizza Express so I was pretty happy that Sarah and Scarlett chose here for our meal. I started off with garlic bread and mozzerella, followed by the Pollo Ad Astra Leggra pizza, and decided to end my meal with a Mulled Wine Crumble, which was probably the most amazing thing I’ve tasted in a while! As there was only seven of us it was really nice to all be able to have a chat while we waited for food, and everyone got a chance to talk as there was a small number of us. After our food we were able to sit and have a few more drinks while Sarah gave us all our Christmas presents – a Christmas Yankee Candle and a bottle of So…? perfume, which were all beautifully wrapped. I think we all had such a great night, full of lots of drinking, eating and laughing. It was so lovely to be involved with the blogging community, especially a local one, and I hope there are more meet ups like this in the future!